Tuesday: Jim Gambino will be serving pasta & meatballs, salad & homemade desserts. Plus bingo afterwards. Wednesday: District Deputy visitation starting at 4:30 pm. Dinner served, inspection & regular meeting at 7 pm. Sport coat & tie for all officers & trustees. Please let Bob Cramer know which officer will be in attendance if you haven't already. 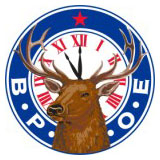 This Sunday........Sep. 23rd - Lodge breakfast at 9 am. Come and join your friends for a delicious meal. September 26th - Indoctrination at 6:30 pm. September 29th - District Initiation at the Golden Lodge at 4:30 pm. Dinner at 6:00 pm. Be sure to talk with Bob Cramer, Exalted Ruler if you have questions. 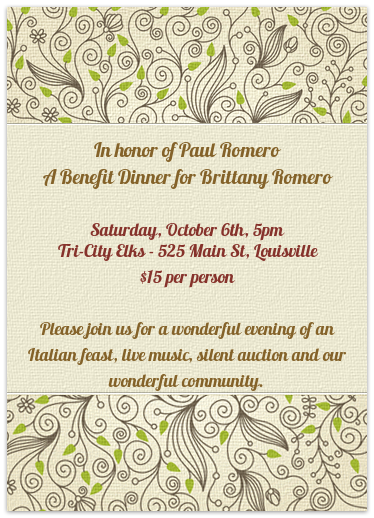 October 6th - Dinner to celebrate our friend Paul Romero & a benefit for Brittany Romero. Betty will be leading the team. See invitation below.